Crickey. I only had to mention Bond and Aston. 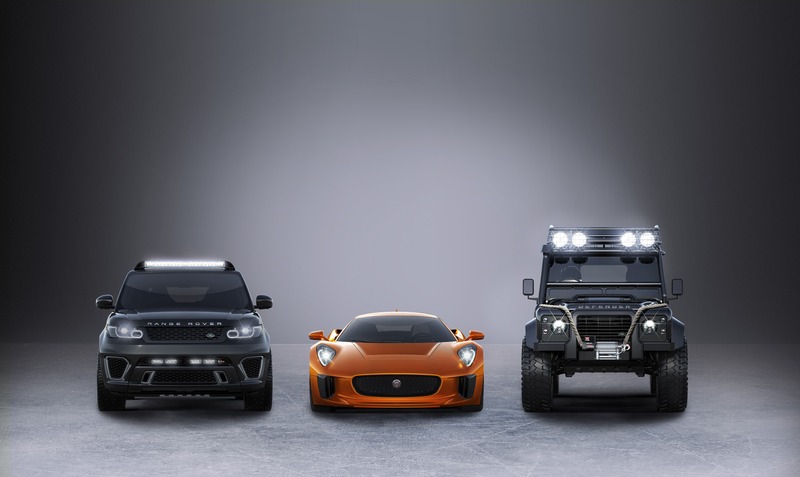 Now I’ve had my hands smacked and must also say that Jaguar Land Rover has a line-up of vehicles featuring in Spectre. These will include the Jaguar C-X75, Range Rover Sport SVR and Defender, which have been provided by Jaguar Land Rover Special Operations. The Jaguar C-X75 will feature in a spectacular car chase sequence through Rome alongside the Aston Martin DB10. The C-X75 vehicles used in filming have been built with the help of the Williams Advanced Engineering facility in Oxfordshire. I’ll wager not many people know that. I certainly didn’t. Well done Williams. Scenes including the heavily modified versions of Land Rover Defender and Range Rover Sport SVR (filmed in Austria). The Range Rover Sport SVR is the fastest and most powerful Land Rover the company has produced with 37in diameter off-road tyres to tackle the extreme terrain. They also feature bespoke suspension systems and enhanced body protection.